Even the most fastidious housekeepers may find themselves battling against mold and mildew. Basements, bathrooms and other damp areas are ideal breeding grounds for these fungal nuisances, though they’re mild (if persistent) problems in most well maintained homes. But if the fungi is allowed to grow unchecked — or worse, if there’s an unknown growth in a hidden area of the home — it can develop into a major issue. If you want to keep a keen eye out for both mold and mildew, you’ll want to know the difference. Mildew presents as a tiny fungus that grows along surfaces as a thin, powdery film that is white or gray in color. 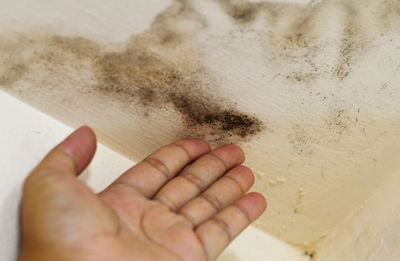 Mold is darker — usually black, brown or green — and can build up more substantially than mildew, creating a fuzzy appearance. Fortunately, mold and mildew are relatively easy to clean. A little scrubbing with a soft-bristled brush and some soapy water will remove almost all of the material, but as long as you’re doing the dirty work, you may as well kill the fungi as effectively as possible. The best way to do that is with diluted bleach in a spray bottle — spray the mixture on affected areas and let it sit for 10 minutes, then scrub clean and rinse.